Guam-based research has made its way to the July issue of the national scientific journal HortScience. The work was conducted in the University of Guam's Western Pacific Tropical Research Center (WPTRC), and focused on experimentally quantifying the light requirements that underpin seed germination and early seedling growth of three native tree species. "While we were working on these experiments, I was thinking about what Dr. Seuss wrote in 1971," said April Cascasan. "I am the Lorax who speaks for the trees...which you seem to be chopping as fast as you please!" As more of Guam's forest species become threatened by ongoing human activities, the need for information generated from formal research has become increasingly important. While conventional wisdom may be valuable, resource managers also need experimentally tested results as a means of improving reliability of the information they use to steer their efforts. For example, the U.S. Fish and Wildlife Service published a 1994 plan for the recovery of Serianthes nelsonii, Guam's only officially endangered tree species. This publication pointed out the limitations caused by a lack of formal research on the species. Yet most of the information generated since that 1994 publication has come from casual observations and anecdotes. "We felt that in order to do a good job of emulating the Lorax, we needed to switch gears and use an empirical approach that would meet scientific standards," said Cascasan. The publishing team was comprised of biology student Cascasan, professor Thomas Marler, and forester John Lawrence from the USDA Natural Resources Conservation Service. 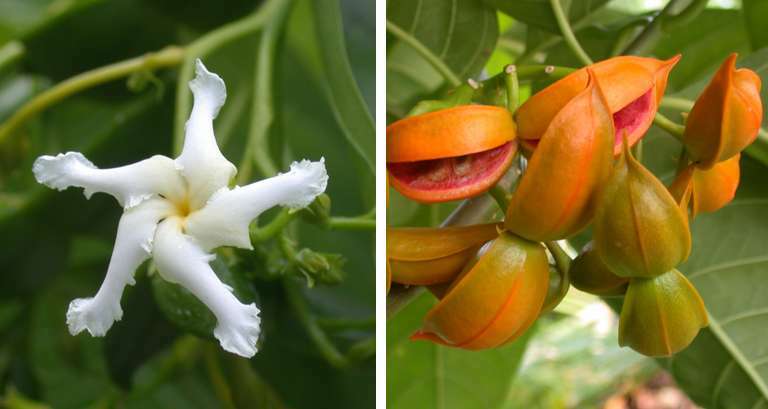 "We determined that Guam's Elaeocarpus joga, Tabernaemontana rotensis, and Serianthes nelsonii seedlings exhibited highly contrasting needs for light even though all three species grow in similar forest habitats," said Lawrence. Research designed to improve tree production methods in a nursery setting can also improve ecological knowledge. "This branch of forestry may be called restoration forestry, and the information derived from restoration forestry studies can be put to use by resource managers and private landowners," said Lawrence. The team's findings confirmed the notion that the influence of light on seed germination and seedling growth is highly complex. Light is required as the original source of energy that plants use for growth. But too much light can be damaging to young seedlings, because they are designed to live and persist in the shaded conditions of the tropical forest setting. Scientists have come to realize that light may be viewed as a language that the environment uses to communicate with the plant. "The opportunity to conduct research through the WPTRC turned out to be a vital component of my biology degree at UOG," said Cascasan. "It helped pave the way for my entry into graduate school where I am continuing research on Hawaii's rare plant species." Without birds, will Guam's forests look like Swiss cheese?